This weekend the Belgian Juniors fought some intense battles to be crowned Belgian Youth Outdoor Champions. The Mooncatchers proved once again their juniors are top of the class by winning all 3 age divisions. Spiritwise it was a topper as well. 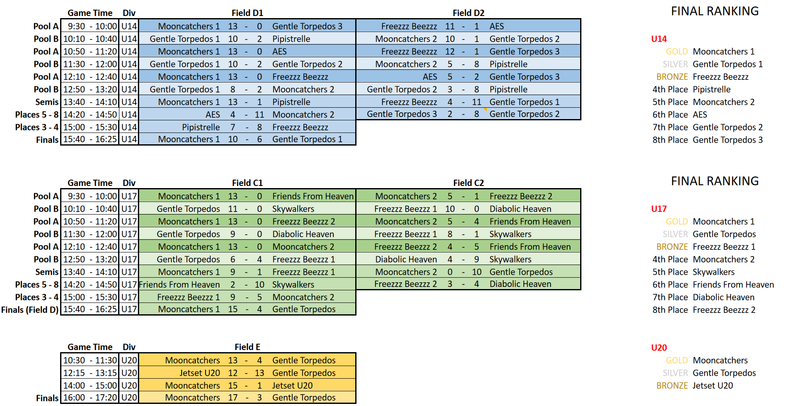 Congratulations to AES (U14), Diabolic Heaven (U17) & Mooncatchers (U20) for having the highest spirit scores! Full Spirit Results can be found here! Thanks to Gentle & especially Dajo for organising this great tournament!